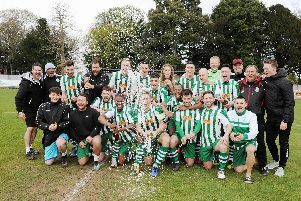 Arundel Football Club joint boss Barry Pidgeon believes his confident side could spring a shock in their upcoming matches. Mullets welcome fifth-placed Newhaven on Saturday, before they entertain second-placed Eastbourne Town at Mill Road on Tuesday evening. Despite defeats against Horsham, Broadbridge Heath and Horsham YMCA in recent weeks, Pidgeon has been pleased with his side’s performance levels and he feels Mullets could collect a good points return from their next two games. He said: “We have got two very tough games coming up at home but we are in confident mood at present. “We may have lost our last three but we played well at Horsham, should have beaten Broadbridge Heath and were a little unlucky at YM. “The boys are playing some free-flowing stuff at the minute and could well produce a shock in these next two games. “Newhaven have not been in the best form of late, so I don’t see why we can’t take something against them.